You may wonder why there is no version of Aegisub that works on Windows 95, 98, 98 SE or Me, together knows as Windows 9x. The reason is part technical-practical and part ideological. The ideological part is short and simple: All of those operating systems are outdated, no longer under support by Microsoft and in general regarded as far inferior to the Windows NT line of systems (2000, XP, Vista). We would rather see people stop using outdated technology. The technical part mostli lies in Unicode support. All Windows NT versions are native Unicode from the kernel all the way to the user interface. Windows 9x is not. The only way to get some kind of Unicode support on Windows 9x is to use the Microsoft Layer for Unicode library, but even that only gives flaky support at best. We did try building Aegisub against MSLU (unicows.dll) once a long time ago, and failed. Then decided that it wasn't worth the trouble. True, Aegisub's support for Unicode isn't perfect. There's problems with right-to-left/bidirectional text and probably also several other complex scripts, but it's far better than only supporting one codepage at a time. Finally, of course, there's the question of number of potential users. In the time this blog has been up (around a month) we've had one sigle hit from a user searching for a Windows Me version. There just isn't a user base large enough to justify the amount of work it would be to create an inferior version. TrayDict is a very simple application that sits on your systray until you bring it up with WinKey+Z. 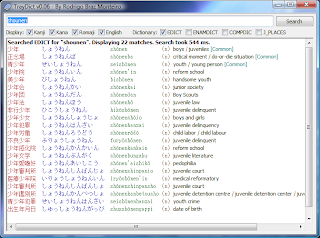 Then it lets you type a word in Kanji, Kana, Rōmaji or English, and it will search for it in EDICT (or any of the other supported dictionaries), returning every match, ordered by relevance. It has a bug that prevents Windows from shutting down as long as it's running. Right click on it on systray and choose "Exit" to terminate it. There are no options at all. The shortcut is WinKey+Z, and that can't be changed. You can also bring it up/down via systray. This is no longer maintained, so don't bother sending bug reports and/or suggestions. For a long time, I've been meaning to rewrite it, with less bugs, more customization, support for regular expressions, rendering with HTML+CSS, Kanji information, etc... But, alas, I wanted to use HTML to render this, and my experience with Trident, Gecko and WebKit were all catastrophic, so I've lost some interest. But maybe, if there is a demand for it, I'll pick this project up again. The source is available here, but the HEAD is completely broken (result of my experimentation with Gecko), so you'll have to dig the repository for an older version. Some time ago our SVN server (source code management) stopped working. We aren't sure what went wrong, and since we haven't been able to reach the administrator of it we've had to move the repository to a new server. Fortunately we have had access to full repository backups, so no data is lost. However we have had to re-create the user database, so if you had commit access before but don't have it now, please contact one of the project administrators. The new SVN server is at http://svn.aegisub.net/.